One of the promising non-invasive brain therapeutic methods is the repetitive transcranial magnetic stimulation (rTMS). During such a procedure, a magnetic coil is placed near the head of the patient and a magnetic pulse is transmitted to a specific damaged region of the brain. This type of magnetic brain therapy has been deemed valuable in the treatment of a variety of psychiatric diseases, such as depression, as well as many disordered brain functionalities, including stroke, multiple sclerosis, and movement disorders. In some countries the treatment is even covered by health insurance packages. One of the primary current challenges of this treatment is to enhance its efficiency by optimizing stimulation time scheduling (the timing of magnetic pulses). In an article just published online in Frontiers in Neuroscience, Israeli physicists, together with a group of German neurologists, suggest that fewer stimulations of the brain are preferable, since neurons "get tired" when stimulated too fast, and subsequently cease to respond to brain stimulation therapy. Their theory contradicts intuition, which implies that faster and more intense training of our brain is a better therapeutic strategy. Following a series of new experiments and advanced theoretical studies, the Israeli physicists, led by Prof. Ido Kanter, of the Department of Physics and Gonda (Goldschmied) Multidisciplinary Brain Research Center at Bar-Ilan University, have demonstrated that each neuron has a maximal firing rate that is much lower than previously assumed. Hence, when stimulated too fast, neuronal response failures occur. "Neurons are like people," said Prof. Kanter. "Stuttering occurs when we speak too fast, errors occur when we type too fast, and confusion emerges when we learn too fast." The research was conducted in collaboration with a group of neurologists led by Prof. Dr. Walter Paulus, from the Department of Clinical Neurophysiology, University Medical Center Göttingen and his team, including Dr. Islam Halawa and Dr. Yuichiro Shirota. "We evaluated a variety of existing rTMS scheduling protocols which offered conflicting results and no clear guideline for the temporal organization of brain stimulations," said Prof. Kanter. "Our findings suggest that slower rates of stimulation may be more effective in brain therapy, and we suggest that this method be adopted in order to maximize effective brain therapy." "While modern computers are composed of very reliable elements, the brain is composed of unreliable elements, since neurons 'tire' and frequently fail to respond," added Prof. Kanter, following the previous work of his students Amir Goldental and Dr. Roni Vardi. This newly-discovered principle of neuronal activity was actually found to be advantageous, since it stabilizes brain activity and prevents hyperactivity. rTMS equipment and trained therapists become more accurate and effective in the localization and real-time tracking of stimulation spots in the brain. However, without understanding how to optimize the stimulation scheduling, the efficiency of the therapy will remain limited. 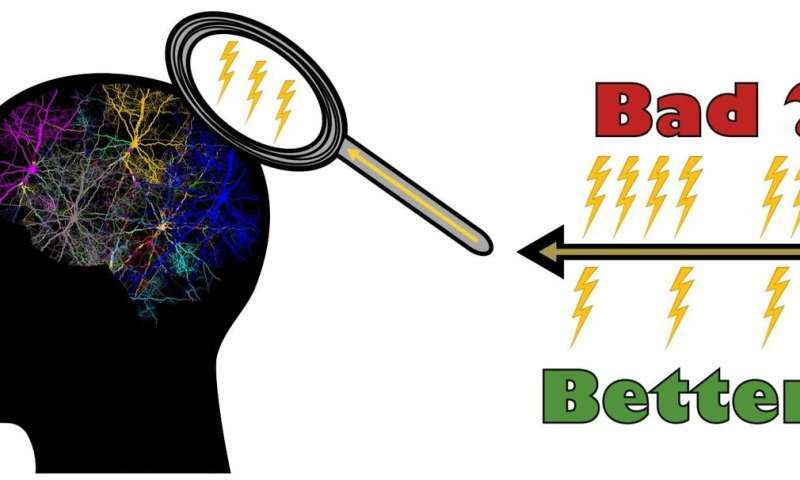 The proposed underlying mechanism "less is more" is one of the first guidelines toward improving this type of non-invasive therapy and exemplifies the necessity and the productivity of an interdisciplinary scientific effort to solve the puzzle of our brain.